According to POPAI, Point-of-purchase Advertising International, the hot buttons for creative design to influence shoppers include: education, clear messaging, inspired messaging, strong design, shopability and navigation. But don’t listen to an advertising and store fixture hack like me. 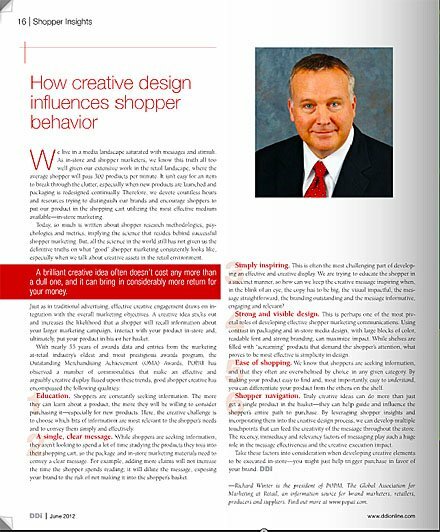 Go right to the horse’s mouth to get insights from Richard Winter, president of POPAI as presented in “How Creative Design Influences Shopper Behavior” in the Display and Design Ideas, June 2012 issue.